If there is anything in the world Void loves, it’s a complex system that he can learn and exploit in video games. When he found out about Hitman, he jumped in and loved it so much, he gifted it to Beej just so this episode could exist. While neither of us really likes the “murder” aspect of the game, it doesn’t feel like it’s really violence. We really do both see it as a puzzle game, and we tend to overlook the violence as it’s a means to solve the puzzles presented. Beej isn’t entirely into complex systems like Void. They have to serve a true gameplay purpose. Some games are complicated for the sake of being complicated and add nothing to the experience, but Hitman is the opposite of that. It feels as though you are learning skills and building on them as you progress. The game really helps you learn the systems through its very thorough tutorials--they don’t really feel much like tutorials, either. If you go through them, you’ll learn a pretty decent path to progression that leads into a lot of replayability. Void describes his perfect 4-step program on how to become a professional hitman, starting with Beej’s preferred playstyle: bumble around like an idiot until people die, then run like the wind and hope you don’t get shot. Void’s system is a bit more elegant. Paris is the first fully realized level, and instead of writing a lot about it here, just know that Void loved it so much that he’s barely played any of the other missions in the game. It is also part of a smaller bundle that you can get to essentially try out the game, and it goes on sale on various sellers all the time. So get it. Beej - Started running again, and really working on getting back into shape while freelance work saps lots of free time for a few weeks. Void also went to the Game of Thrones Live Concert Experience, which is a live performance of the music. It was amazing. The first half was not cohesive and felt like a bad fanmade video, but the second half made up for it. The second half used full sequences that built on each other as the music played. It used the Battle of the Bastards and the Great Sept of Baelor scene from the end of the season 6. The Nintendo Switch is almost here! And some new Zelda, Breath of the Wild info, in case you missed it. We get a jump button! We are both going through pretty major life transitions right now, and we expect some of you are, too. We wanted to discuss how we’re coping with them so that maybe your life can get just a little easier. Mostly talking about new jobs because that’s the kind of transition we are both going through, but lots of things cause them, from health to marriage to kids to a hundred other things. What’s funny about us, though, is that we traded--Void went from freelancing into a full-time position, while Beej went from a full-time position to freelancing. Weird, right? 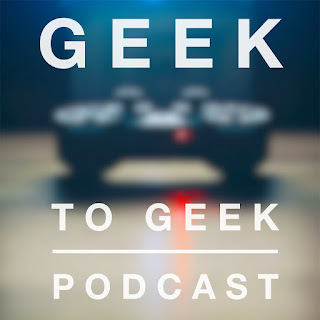 It turns out that we have kind of the Geek to Geek Career Corner this episode inadvertently, so we talk about how we use our skills from other places to really move into something we love, and that even though we are changing, it’s still a career path that we both intended to take, and that some things happened by accident. The hardest parts of life transitions, though, are how routines get thrown off, sleep being hard to get, and how sometimes, our bodies just aren’t able to cope with the change in ergonomics and space that we are thrown into when you’re changing jobs or locations. Somtimes, it’s hard to motivate yourself because your routine is so different, and even when you can get the ergonomics right for your space, finding that space itself can be hard in a new location. We both play video games (obviously) to destress from the changes in our lives, and mainly use mainstays that don’t take a lot of brainpower to get through. Both of us tend to work with stuff going on in the backs of our heads, and learning new mechanics and systems and anything complicated just makes us that much more exhausted. Podcasts and audiobooks are a great way to just escape, break out of work mode, and use them on commutes. While they take some active brainpower to listen to, they can be more passive than sitting and reading, which is great when you’re experiencing transition fatigue. And you gotta exercise. We aren’t doing as much as we’d like, but it helps a lot. Going out and running in good weather, using a stationary bike, even doing yoga stretches at your desk or between projects is a great way to make your day seem a little less exhausting. You can also dedicate some time in the morning or the evening to have some specific active time that you distance yourself from whatever your transition is, keeping that period up with your normal routine that’s been changed. And everyone has some comfort TV. Void loves anything witty and well-written like Aaron Sorkin’s The West Wing or YouTube videos that don’t have a deep time commitment, and Beej loves old sitcoms like New Girl or Parks and Rec to keep him giggling with it in the background. Book Recommendation: My Life on the Run by Bart Yasso - Get it for FREE at audibletrial.com/geektogeekcast and support the podcast while you're at it. Beej was on Dumbbells & Dragons podcast this week. Much stuff is discussed, and Kenny is good people. Go listen. Geeks love toys. And collecting things. It’s just kind of what we do. So we wanted to talk about that for a while, and really dig in deep about the kind of knick-knacks that we keep around us at all times, those that are special, and the kinds we just don’t care about. Void is very particular about what he collects, and Beej is now. He used to be a “gimme all the stuff” kind of person, while Void has always been more pragmatic about the kinds of collectibles he buys. But you folks could have probably guessed that. Knick-knacks don’t always have to be physical, either. We talk about collecting in games, such as Pokemon and MMO items, getting ultimate weapons in Final Fantasy and things like that. Do we finish games all the way and feel as though we need to get every single thing we can? And nowadays, there’s a huge surge in toys-to-life products. Skylanders, Disney Infinity, Amiibo, Lego Dimensions. All of these are huge money sinks, but they’re also fun to play. We talk about the line between collecting and playability, as well as the intrinsic value the toys add to the games themselves. For te most part, Void keeps a few geeky knick-knacks on his desk, and he wears oodles of geeky t-shirts. What’s also very cool is that he has a bathroom in his house decorated in Penny Arcade comics. That’s awesome. Beej is actually selling off a lot of his old collection, and only trying to keep the things that really matter. He decorates his office in things that mean something to him, much like Void did his bathroom.